With the exponential growth in connected devices, the IoT (Internet of Things) is a key driver of digital transformation in several industries. The biggest growth is in applications and analytics. Improving supply chain processes in retail and manufacturing are considered one of the hottest application for IoT per Forrester. STEM For Kids® is announcing an expansion of its programs in the IoT space to engage school age children in this exciting and growing industry. Programs are available as summer camps, track-out camps, afterschool programs, in-school field trips and workshops, weekend classes and other enrichment classes. In the second course called Supply Chain and Warehouse Edition, students will use Raspberry Pi, to create simple examples of warehouse automation. 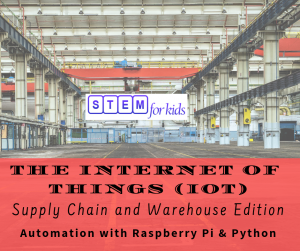 Participants will make smart sensing devices using the Raspberry Pi and program it using the Python Programming language to check for temperature and humidity levels in their mini warehouse. They will collect data through their devices and analyze the data to detect fire, water leakage and intrusion. They will then extend their device’s capabilities by automatically notifying and alerting the right personnel to handle any urgency. Through this action-packed curriculum, STEM For Kids aims to inspire the young minds to imagine really cool IoT applications and figure out the means to implement their imagination. “We are using Raspberry Pi for real-life applications in my work and it is really exciting to see that STEM For Kids is bringing the knowledge of Pi to young children”, says Tom Hyatt, a member of the STEM For Kids’ Curriculum Advisory Committee, a franchisee and a senior network support and solutions engineer involved in developing Artificial Intelligence (AI) and Machine Learning (ML) applications for his clients. Learn more about the weekend classes, in-school programs, summer camps and afterschool programs being offered in IoT by contacting your local STEM For Kids’ company or franchise representative. Visit stemforkids.net to see our program locations or request programs at your location by visiting stemforkids.net/inschools. STEM For Kids® provides a comprehensive curriculum comprising of engineering, biomedicine, computer programming / coding, robotics, automation and business programs for school-age children through summer camps, trackout camps, afterschool programs, weekend classes and classes in and outside schools. Business owners can start with as low as $20,000. Entrepreneurs looking for a low-cost entry into children’s educational services can learn more and apply at the STEM For Kids website, https://www.stemforkids.net/franchise or call +1 866 991 7053. Schools, Principals, Superintendents, STEM Coordinators, Teachers and After-School Coordinators can bring the innovative programs to their schools as camps, in-school field trips, classes and after-school / before-school programs. Request on-site programs or curriculum training / professional development at https://www.stemforkids.net/inschools.